The mystery is about to be lifted and the few of the most important gadgets of the year will be revealed in one week. Apple sent out invitations for the iPhone 5S launch that which will take place on September 10th at Apple headquarters in Cupertino, California. The event will begin at 10 AM Pacific time. 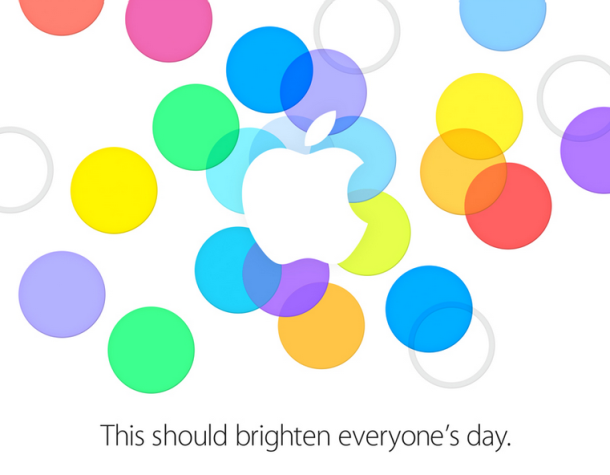 The tagline of this year’s Apple event is simple and probably represents an introduction to the upcoming iOS 7: “This should brighten everyone’s day.” is the text written on the Apple invitation sent journalists. It’s funny to see that Apple’s announcement overlaps perfectly with the Berlin IFA technology fair, almost mocking it. It is a known fact that they don’t participate at such exhibitions. So, what should we expect from this year’s event? We should probably see the next iPhone, which according to all rumors will be called iPhone 5S. Along with it, we should meet the first cheaper iPhone called iPhone 5C. Both phones appeared in several images and videos that were leaked on the Internet. Although most rumors are about these two devices, we could witness a new iPad release, maybe a new iPod release. The wave of rumors regarding a future Apple smart watch were put to rest recently, and there are small chances to see this device released. Apple will hold a similar event in China the next day, on September 11th.